Advocates for promotion and relegation in the United States spend a lot of time debunking speculative defenses of the existing order. One of the more common tropes is MLS simply won’t allow it to happen. I don’t have a ton of patience for that argument—for one thing, it’s self-fulfilling and thus uninteresting—but at least one part of it needs to be taken seriously. Because while pro/rel advocates can point to the fact that it’s not entirely MLS’s decision, it is obvious that pro/rel would be easier to achieve if MLS agreed to it. Others have pointed out reasons why MLS is unlikely to be a full-throated pro/rel backer but the point of this post is not to wade into the general morass of that question or to examine the ability or general willingness of monopolistic entities to give up control, but instead to highlight a particular reason why MLS fights against pro/rel, which also happens to be a very good argument in favor of an open system. MLS wants to expand its access to the lucrative stadium scam that the four major sports (1), particularly the NFL and MLB, have been running for years, and it can only do that if it remains a closed league. Everyone knows that stadiums (2) are a bad deal for municipalities. Teams usually trot out the same shill to defend their deals, but virtually every serious source that has addressed the topic has found that these deals are bad for cities. The owners, like all snake-oil salesmen, push grandiose promises about the benefits of a new stadium, and the motivated thinkers in the political class lap them up like homeopathic remedies, despite all available evidence. Even leaving aside the impropriety of handing massive tax breaks and subsidies to some of the richest people and entities in the world, heavily subsidized sports arenas are just, on balance, not good deals for their locations. Here’s the catch: this extortionist swindle only works if there is a credible threat to leave, and there is only a credible threat to leave when you artificially constrain the number of teams that have access to the top division. As long as cities are permanently frozen out of the top division absent expansion or taking a team from elsewhere, some of those cities will be willing to heavily subsidize the construction of stadiums. An open system changes this dynamic. If you have an open system, teams will invest in accordance with what their market can bear. (7) If supporters have a hope that their club can one day enter the top division, those fans aren’t likely to trade in their existing loyalties for a shiny new MLS club. (8) In other words, they won’t need to approve massive expenditures to lure a team from elsewhere if they can help build up an existing team in their own market, which would eliminate the threat to move. And taking away the threat to move means that those municipalities have a much better negotiating position against their existing teams. Simply, without the threat to move, teams would not be able to shake down cities for lucrative public expenditures. The MLS apologists will say that this impedes the growth of the game, because it hinders investment in top-flight facilities. That is only true if you think that the burden of creating those facilities should be with the public fisc, rather than the owners and governing structures of US Soccer. Even to the extent that owners would pass along costs to supporters, it is far more equitable for those of us who either like soccer or who stand to profit from it to bear the majority of those costs. Moreover, shifting the burden of these costs onto owners in an open system would match stadium investment to a club’s ambition. 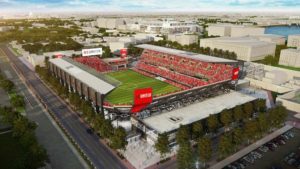 MLS has already taken advantage of public financing for stadiums, like the white elephant of Bridgeview, Illinois, where the Chicago Fire play. The league wants more of this money. Don Garber has explicitly said as much, defending the closed league by asking: “What do you tell a municipality who invests in a public stadium and expects to have the revenue streams that come from being in the First Division?” That question is dishonest in two ways. First, it assumes that the municipality will see revenues from the stadium, which is demonstrably false, as stadiums tend to cost cities money and generate small or no extrinsic economic advantages, while owners capture whatever benefits there are. Second, it is question-begging, insofar as it presumes that leagues should be deciding which cities are worthy of a top-division club, rather than having the market determine what an appropriate level of investment would be for a given city. Garber’s argument makes another dubious assumption: that there will be the same level of interest in the lower divisions in an open system as there is now. It’s fair to point out that average division 2 attendance (especially when we leave out the occasional outliers on the high side, like FC Cincinnati, and the low end, like the MLS2 squads) wouldn’t justify stadium construction on the scale that a top-division league deserves. But is there anyone who seriously doubts that interest in the second division would be higher if there were promotion? Franchises threatening to leave their homes unless the taxpayers buy them a shiny new stadium has become a familiar story. It’s also easy to understand why politicians and voters still fall for the threat; no one wants to lose their access to the highest level of play in the country. An open system would eliminate this threat and the lucrative subsidies teams can extract with it, which is why MLS will continue to fight for its closed system. -Jake Steinberg is the chairperson of San Francisco City FC’s members’ board. His work on soccer has also appeared on The Economist’s Game Theory blog. He sporadically tweets, mostly about SF City but occasionally about basketball, law, and his dog under the handle @SFJoachim. 1. Culturally, I think you could probably argue that soccer is already a bigger deal than hockey in much of the country. Regardless, when people use the phrase “big four” in reference to sports in the US, they typically exclude MLS. 2. Yes, I know the plural of “stadium” should be “stadia.” Stop being so pretentious. 3. You could make this story more complicated and talk about politicians reflecting constituent demand, wanting legacy projects, and simple corruption, but for our purposes, these all amount to the same thing, wanting their team to stay put or wanting to attract a team from another city. 4. Ironically, Major League Baseball’s antitrust exemption has helped keep the A’s in Oakland. 5. The Rams are a particularly egregious example, because they pulled this scam twice, once convincing St. Louis to build them a stadium, and then, while the citizens of St. Louis still owed millions on the stadium, moved back to Los Angeles when St. Louis refused to build them a new one. The Rams defended the move by claiming the team didn’t take public money in LA, conveniently omitting the millions in tax breaks they got. The Rams owner, Stan Kroenke, became the majority owner of Arsenal sometime after the club built Emirates Stadium with no public money. He also owns the Colorado Rapids and if you don’t think he intends to pull this again, then I have a soccer-specific stadium to sell you. 6. These teams all made explicit threats to leave, but even teams that haven’t done that have the implicit threat that they will relocate. 7. Public financing of stadiums occasionally happens in open systems, but it’s less frequent, and usually requires some other catalyst, like an Olympics hosting bid. Even then it can be controversial. West Ham’s stadium deal, which was a much better deal (at least on paper) for taxpayers than the typical American one, still led to a government inquiry and public outrage. 8. I don’t know that it is fair to blame fans, particularly less obsessive ones, for preferring the highest level of play available to them, even if I also think that pro/rel would raise that level of play across the country. That said, I hope the people of Detroit ignore Dan Gilbert’s latest insult to decency and continue supporting Detroit City FC.